Invisible boundaries are laid out beautifully, visually, and sometimes starkly, with the borders of neighborhoods and their racial makeup becoming breathtakingly obvious. People as dots hasn’t been this illustrative since Georges Seurat pioneered pointillism, except the subjects are real cities, towns, and on a grander scale our country and our collective identity. According to its makers at the Weldon Cooper Center for Public Service at University of Virginia, the map is meant to be a snapshot of the United States of America. There are 308,745, 538 dots on the map, meant to account for each person tallied during the 2010 census. The map was conceived by researcher Dustin Cable and can be zoomed in quite close, allowing the illumination of distinct neighborhoods and city blocks. Miami has always been a racially charged city and it remains that way today. Much of the city's postwar development can be traced to early Jewish influxes of the 1940s-1960s from New York and the rest of the Northeast. The city was further built on the Cuban arrival of the 1970s refugees; today half of Miami Dade’s population is Hispanic, making it the largest county in the United States with a Hispanic majority. And there are the wounds cut deep by the unjust death of African American Arthur McDuffie which spilt the symbolic blood of the race riots of 1980. 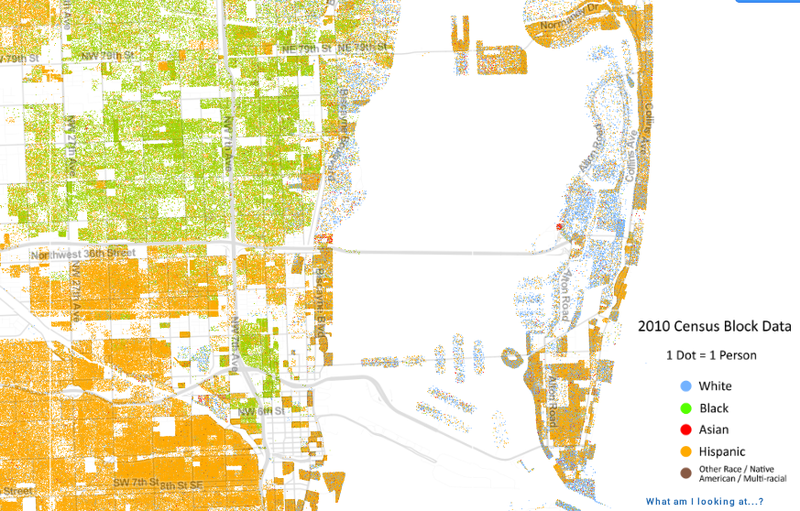 “The map shows how Miami is supposed to be this diverse place but it's incredibly segregated by race, ethnicity, nationality and of course income,” argues Josh Diem, a clinical assistant professor at the University of Miami. “Everyone from the Chamber of Commerce to the Tourism Board loves to talk about how diverse Miami is but it’s just as segregated as everywhere else,” says Diem, whose work focuses on race with respect to the public school system. He believes that the map also illustrates the reality of why most public schools end up leaning heavily towards one race, and why minority students end up behind in the long run due to resources. Statistics available through the Florida Department of Education looks at race by school as of November of 2012 linked here (leads to an Excel spreadsheet). When looking at the schools in Miami-Dade County, most of them are dominant among either black, white or Hispanic. Much like the neighborhood delineation, our public schools fall into the same category. This is just one way of reading the map with respect to Miami and South Florida. What other uses could be found for the map? There are so many other questions that can be explored. What is the story with that clump of Asians immediately north of Mt. Sinai on Miami Beach? I thought there were no Asians in Miami. It doesn’t seem that the map itself offers any concrete solutions, but rather a lucid and different way of using technology to see where and how we live. Despite what many might choose to think or espouse on the subject, race is infused into even the smallest minutiae of our American lives. The conversation is sometimes a divider, often with heated personal feelings showing themselves. Yet those conversations are based in practical realities, and it is sometimes helpful to see them drawn out.